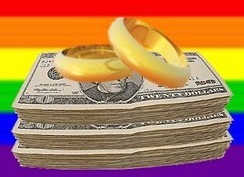 Marriage equality is almost a business imperative. For example the trends that we have to hire the best and brightest have always required companies to begin with what happened to New York thirty years ago by offering domestic partnership benefits. But marriage actually just ups that ante. It just assures that equality of relationships everywhere we turn in every market and in every jurisdiction. I think gay marriage will help strengthen a lot of businesses because households that are married have stability and are the ones that are more likely to put down roots in their communities. They’re the ones that will spend money to buy a house more often than not, that will have children more often than not in the future and to spend money the ways that every family spends money, college and vacations and you know diapers. I think that those things we’re spending money on now but I think that what marriage equality does is it gives us the stability to make long term plans and that allows us to do it in a more thoughtful way.